Household goods packing and moving is way more complicated than you can imagine. And if you are planning for a do-it-yourself packing and moving of your household goods, then I think you should be concerned about safety of your goods. Proper packing of your household goods is seriously important because the safety of your household belongings lies majorly on how well it is packed. And that’s the reason, why we get so many calls from users who want to take control and pack and move everything on their own. Most of the time, they fail to understand what types of packing materials they should use? Well, if you are planning to pack and move your goods safely and wondering about what types of household packing materials you will need to pack and move safely then here’s the post worth checking. Today I am sharing the list of the 14 most essential household packing materials you will need to pack and move all your household goods safely. While the strong and hardy items can still survive the jerks and minor collision of boxes, inside the truck, the delicate ones are too much vulnerable and that is why proper packing, with good quality packing materials is so important. It is true that packing the items very tactfully will help you protect your items better. But it is also equally important that you choose the right kind of packing materials and of good quality to pack and move everything safely. No matter how much you try to protect your items by packing perfectly, if the packing materials you are using are not good, your hard work may go in vain. Now, since you can’t afford to compromise on the safety of your household items, it is obvious that you must use the best quality of packing materials. Boxes and tapes are the common packing materials that we all know, but there are other special packing supplies as well, which is used by the professional moving companies to securely pack the materials. And, to help you pack and move everything safely, I am sharing the list of 14 essential household packing materials and supplies that you can’t afford to ignore. If you use these packing materials to pack your goods, you will be able to minimize the risk of damage during transportation to a great extent. Ever wondered about what makes home relocation so complicated? The complication comes because of various types and size of materials. Packing smaller household goods and appliances is easy when you have the right kind of packing supplies. But handling bigger furniture and appliances like washing machine, refrigerator etc is a bit tricky. As far as home relocation goes, transport is the most uncertain part as you never know what may happen on the road. You may be stuck in bad weather, the roads may not be perfect, you may end up in an accident etc. In fact, anything can happen that may cause damage to your household belongings. The one and only way to ensure maximum safety of your goods is packing and loading your good properly and with utmost care and attention. The packing materials play a significant role in packing of household materials and so you need to arrange enough of essential household packing supplies before you start packing. Whether you have hired a movers and packers company or you plan to pack and move on your own, knowing what kind of packing materials should be used for best quality packing can be of great help. At times, moving companies also compromise with the packing materials, not because they are not aware of it, but because they don’t have the budget. Customers at times negotiate so hard that they simply negate the importance of good quality packing supplies. So be wise and make sure that your gods are being packed with good quality packing materials as described below. Irrespective of whether you are doing it yourself or a professional packing and moving agency is packing it for you, it is equally important to pack everything safely for hassle free relocation. There are various types of household packing supplies available today, from commonly available cardboard moving boxes, to specialty boxes, warping paper, bubble wraps and packing peanuts etc. there are various types of packing supplies available today that can be used to minimize the risk of damage while relocating. Listed below are the 14 of the essential household packing materials that can be used to pack and move all types of household and other goods safely. Well, this tops the list of essential packing supplies, as it is the most commonly used household packing material that is used in packing and moving. Moving boxes are available in various shapes and sizes, and which types of box you should be using depends on the kind of materials you want to pack. Most commonly, these cardboard moving boxes can be used to pack materials which is not prone to damage like clothes, kitchen boxes etc. Since, the items you will own will be mostly of varying shapes and sizes; it is best to buy the cardboard moving boxes of various sizes starting from small ones, to middle ones, to large ones to extra-large ones. Having boxes of various sizes will help you pack your belongings of all shapes and sizes comfortably. Make sure you get a good mix of all of them so that your belongings fit in well. But just remember, if you are using moving boxes of different sizes, then pay attention at the time of loading these boxes in the truck. Loading should be done in such a way that there is no gap between the boxes, or else they collide with each other. So load these boxes carefully and you will be able to relocate without any damage. While the moving boxes are for packing of general items, the specialty boxes are especially meant for proper protection of your delicate items. The number of such boxes will depend on how big your closet is and volume of delicate items you are planning to carry. Here are the types of specialty boxes that you may consider buying for optimal safety of your belongings. Wardrobe boxes– If you love your clothes and have many of them which you want to carry to your new home, then the wardrobe boxes are a good option for you to buy. These boxes have a metal bar holding hangers which will enable your clothes to remain in good condition and not get wrinkled or damaged during the move. You can buy such boxes one for each closet full of clothes you have. Heavy duty boxes– Heavy duty means double walled boxes and so you can easily carry the lamp shades, plants and other delicate items in it for double protection. Cell kits– These boxes with dividers are best for glasses and small, fragile items. This is because you can actually wrap every single item and place it in its own cell which will provide highest level of protection to the items while moving. Electronic boxes– I think by name itself, you can guess its importance and purpose. Well, you can use these electronic boxes for packing the monitors, computers, and other forms of electronic goods that you feel may be susceptible to problems from static electricity. Wrapping papers are one of the important packing materials needed during home relocation because you need it to wrap the items which are delicate. You may also use them to fill in the gaps in the boxes that may otherwise damage the items during transportation. For this, plain newspaper or brown craft paper will be just fine. And, for wrapping the items with sensitive finish, it is best if you use tissue paper or plain newsprint paper. Bubble wraps are the most popular and a safest kind of packing supplies that can be used for wrapping of fragile items. Using bubble wraps is probably the best option to protect the fragile belongings and sensitive items during a move. You just have to bubble wrap the breakables valuables items and these air-filled wrapping materials will absorb all the undesirable shocks and protect the items during shipment. Packing peanuts are used to fill the empty space inside the box. You can use the packing peanuts to fill up any empty space in a moving box irrespective of its size and shape and thus will provide excellent protection and padding even to delicate and sensitive items. For maximum protection, you just have to cover the bottom of the moving box using a thin layer of peanuts, place your belonging and then again cover it with another layer of peanuts. After that, shake the box well so that the peanuts fill up all the empty spaces and then add a final layer before sealing the box. The styrofoam peanuts are not biodegradable and you will face difficulty in cleaning up and disposing it off. So, I would recommend you to go for the starch peanuts because although they are costlier but they are eco-friendly. But, remember that they decompose when they come in contact with water, so be a little conscious in case you are moving in extreme humid conditions. If you have some extra heavy weight items which may crush the peanuts and bubble wraps, I would recommend you to use foams. When you wrap the heavy weight items like fridge, washing machine etc using foam then it gets proper protection. Wrapping with foam will be very beneficial for you in case the road is rough or the truck meets some accident. These foams are basically used for cushioning and it forms a very good protective layer and helps you avoid any sort of damage including scratches. You can buy the moving blankets as they are big and thick and can be wrapped easily around big furniture like wardrobes, show peace etc. This will protect them from any kind of scratching and denting as well as from getting covered with dust and dirt. They also provide the additional cushioning and protection to your belongings in the moving truck. They can also be wrapped while you are carrying the bulky items down the staircase to avoid scratch and damage. The other element in the list of household packing materials needed during home relocation is movers stretch wrap. It kind of resembles a kitchen plastic wrap or saran wrap but it is far more durable and has the ability to withstand the rigors of moving really well. You can use the movers stretch wraps for protection of certain surfaces throughout the moving process or use them to hold or bind things together. However, just be a little careful if you are moving in extreme hot regions during the summer months. This is because if you keep it in extremely hot weather conditions for a long period of time, then it may cause some damage to the delicate finishes of your belongings. Needless to say labeling each of the boxes correctly is important because when the packed boxes are labeled properly, it will help you easily locate the items at the time of unpacking. Imagine you are looking for a towel and there are over 30 boxes in the room, how would you know which box to open? But when you have labels on each of the box, you can easily locate the box that may have towels. Proper labeling on the packed boxes is important and you must buy labels for every box. You may even print your set of labels and use them. Some people however, do not do any writing but simply buy labels of various colors so that they can keep their own track and differentiate between the boxes. You can use any of the methods you feel comfortable with, but labeling each of the boxes is a must. If you want to label the boxes by writing on them, then do not forget to buy a permanent marker. Box cutters are important items and you must buy at least one during your home relocation. This is because it will come to your great help when you reach your new home and will have to unpack and open or break the boxes. You will be able to complete the whole unpacking quite fast with a box cutter, which would have otherwise taken too much of your time. Most of the time we have it in our home but I want you to buy one of really good quality as it will be needed while you are unpacking your bags. It will be very useful to cut the tapes and open your boxes. So, do not miss it out while you are buying the packing materials needed during home relocation. If you are planning to shift your mattresses from your present home to your new home, then I think buying mattress bags is a must. Mattresses are so big and of huge size that they will never fit into the boxes that you have brought, so it is best if you pack them inside the mattress bags. This will give complete protection to your mattress while transportation. Apart from the mattress bags that are especially meant for packing the mattresses, there are some other bags as well which is important for you to buy. Like for example, you can buy many sealable bags as those will keep the smaller items very safe and secure. Then there are vacuum bags which you can use to pack the clothes and the bedding as that will save a lot of space. Next are the garbage bags which you can use to hold your bric-a-brac. Buying packing tapes is of paramount importance as they are used to seal the boxes or secure the wraps around the boxes. You can keep a packing tape dispenser with you as it can then help speed up your packing and will prevent situations where you may accidentally tape your fingers or the tape may stick to itself. The moving straps or the strong robes are also very essential when you have to wrap the materials in place, secure the drawers or the doors of the furniture or to secure the already packed materials in the moving truck. Over to you: which essential household packing materials do you use? The whole process of home relocation is quite exhausting both mentally and physically but I feel that the packing is the most crucial part because you need to arrange, organize and pack the items properly so that they are safe and do not get damaged during the move. And, for doing the packing, you need good quality household packing materials as you can never compromise with the safety of your belongings. I have today discussed about 14 of the essential household packing materials needed during home relocation. 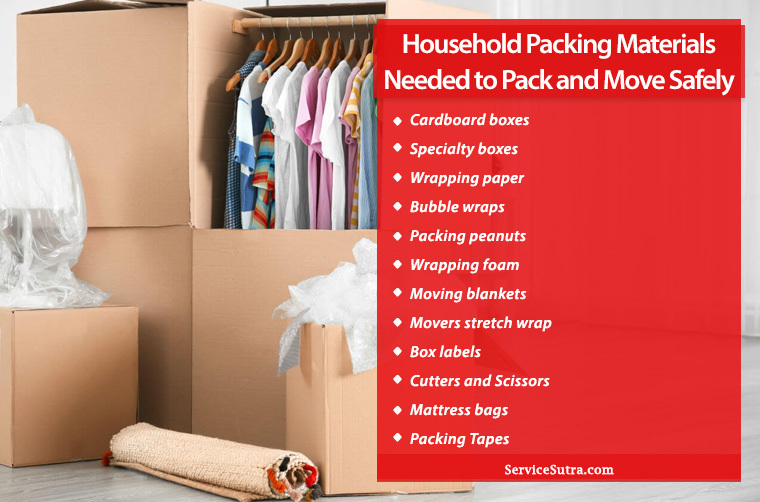 There are other packing supplies as well which you can use but I feel that these 14 items are the must-haves when it comes to do it yourself packing and moving of household materials. So, when you go to buy the materials, you can definitely refer to the list of household packing materials we have discussed above. But if you have engaged a professional movers and packers for the job, even in that case you should closely supervise and ensure that they are using these materials to pack your goods. These are the most commonly used household packing materials which is used by the professional moving companies, but if he one you have hired is not using these packing supplies, then you should check the packing quality and ensure that the goods are not going to get damaged during move. I hope this list of best household packing materials needed during home relocation will help you pack and relocate safely. But if you have managed to relocate on your own in the past and if you are aware of any other essential household packing supplies that can help relocate safely then feel free to share by commenting below. I will be happy to edit the post and add other materials. And, if you like my post, please like, comment and share it with others. Until then, stay happy and have a safe home relocation.